Warmer Frühling, kühler Sommer und ein goldener Herbst - so gestaltete sich das Weinjahr 2014 an der Rhone. Die Weine werden von guter bis sehr guter Qualität sein. Stilistisch fruchtig-elegant, sehr aromatisch und geradezu saftig, aber weniger wuchtig (körperreich) als andere große Jahrgänge. Seidige Gerbstoffstruktur. Somit werden die 2014er auch bereits früh Trinkvergnügen bereiten. Einige Winzer vergleichen 2014 sogar mit 2000: rund, ausgewogen, mit zivilisierten Tanninen und einer kühlen nördlichen Aromatik. "Robe grenat sombre. Nez racé, floral, griotte, petits fruits rouges, épices fines. Bouche concentrée, virile, profonde, dessinée autour d'une magnifique matière veloutée, grande finesse des parfums, tabac, garrigue, très harmonieux. Somptueux." "Aged for 12 months in concrete. Wonderful nose, vibrant defined fruits and garrigue herbs. Touch of plum sauce. Medium- to full-bodied, flowing and generous but all shot through with rapier acidity. Ends fresh and bright. A powerful wine, not with weight but with intensity and steeliness. You really want to drink this. 6,000 bottles. 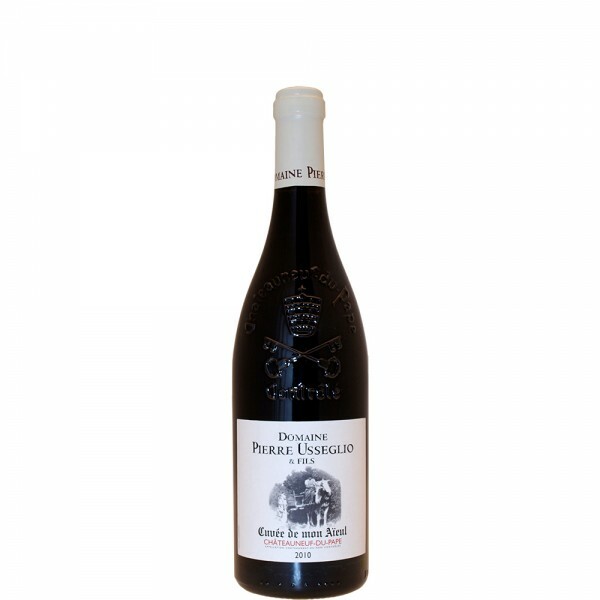 2016-2026"
"The 2014 Chateauneuf du Pape Cuvee de Mon Aieul is, as always, 100% Grenache brought up mostly in tank, with smaller portions in barrels and demi-muids, all of which are on- to three-years-old. Like all top 2014s, its charming and sweetly fruited, with classic Grenache notes of toasted spices, incense, roasted herbs and sweet red and black fruits. It's nit a blockbuster, but is beatifully balanced and silky, with fine tannin, no hard edges, good concentration and outstanding length. Drink it anytime over the coming decade." "Up with the crème de la crème of the vintage, the 2014 Châteauneuf du Pape Cuvee de Mon Aieul is 100% Grenache, was mostly destemmed, and aged 70% in concrete tank and 30% in one- and two-year-old demi-muids. Full-bodied, rich, nicely concentrated and layered, it’s loaded with Provençal notes of ground herbs, crushed flowers, licorice and black raspberry. It’s a charming, forward example of this cuvee that should have 10-15 years of overall longevity. Both the 2013s and 2014 from the Usseglio brothers are solid, and they have more texture and charm than most in the vintage." "Deep ruby. Mineral-accented red and dark berries, anise and pungent flowers on the highly perfumed nose. Impressively concentrated, expansive flavors of raspberry and candied flowers are complicated by deeper licorice and dark chocolate qualities that sneak in on the back half. Sweet and precise on the finish, which shows excellent clarity and round, harmonious tannins." "One of the top wines in this mixed vintage, the wine shows good color, layers of sweet, lushly textured, dark, cherries and a spicy, fresh, peppery finish that sticks around on your palate." J. Robinson: "Tasted blind. Dark crimson. This almost smells like red bordeaux! Very good structure with lots of sweet ripe fruit (not at all bordelais-like) with sufficient freshness and refined tannins on the end. Really rather delicious."